Casa Sorpresa in Sayulita is an enchanting escape located in the wonderful surfing and fishing Village of Sayulita just 45 minutes North of Puerto Vallarta. A private Spanish Hacienda, Casa Sorpresa lies behind large iron gates with lush tropical gardens and palm trees, surrounding a large three tier fountain. An inviting azure salt water swimming pool, with its own waterfall is a wonderful place to relax. It is a truly a magical space. A convenient outside bathroom with shower is located behind the pool. Two air-conditioned master suites with queen beds and private baths, each bedroom has a full size day bed. Casa Sorpresa acommodates 4 adults comfortably. (Up to two children is fine, please check with us first). Beautiful hand carved Cantara stone columns support the tile roof covering the open veranda Living and Dining Space for entertaining or to listen to the serenity of the large fountain and the bathing birds. Beautifully decorated with hand made local wood furniture and painted in vibrant Mexican Colors. A fully equiped kitchen opens to a back yard Patio space with fountain. Amenities include Bath and Beach towels, bed linens and bottled water, housekeeper, gardener and pool service, 3x @ week. Casa Sorpresa is a peaceful, tranquil getaway for one or two couples who wish to enjoy the Village of Sayulita for a special vacation. Children are welcome. Please utilize the contact form to get in touch with any questions and to request a reservation. Our entire family LOVED staying at Casa Sopresa! Rene the manager was great, let us in, explained a few things and gave us some local tips :) The house is beautifully kept and the location superb. Really looking forward to returning! Magical house for lifelong vacation memories! Casa Sorpresa was absolutely outstanding! We had a wonderful time at this lovely home. This gem is steps away from the beach, and mere minutes from the busier center of town. Everywhere is walkable! Quiet, relaxing, amazing... pool, hammock, fountains! Check in and check out were both easy as breeze, and communications timely. 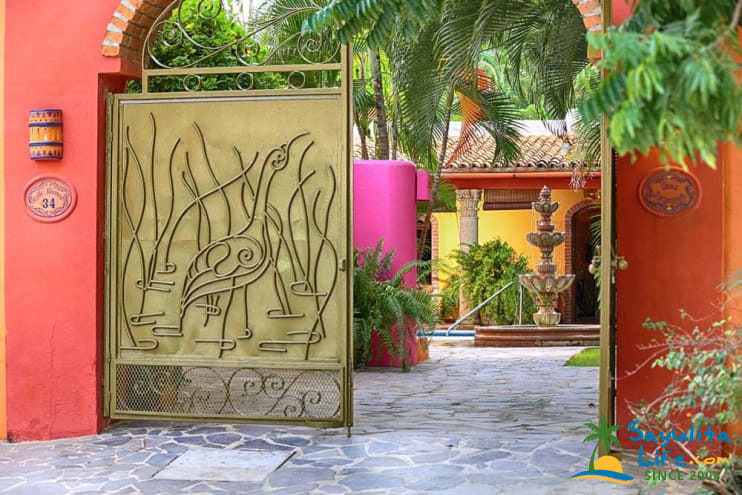 Stepping inside the gates of Casa Sorpresa is like walking into your own little oasis. Lovely entry courtyard with an outdoor shower/bathroom, a beautiful pool with its own waterfall and lots of huge shady palm trees combine with authentic Mexican decor to create a super relaxing ambience. The bedrooms are huge with very comfortable beds, the kitchen extremely well-equipped and access to the laundry room is through the rear courtyard, another spacious area with its own fountain. Location is wonderful, literally a few minutes walk down the street to the beach and, at the most, 5-10 minutes walk into town for groceries, wine, beer and helado/churros in the evening! The staff kept everything immaculate - Rene so welcoming and helpful. This was our 5th vacation in Sayulita - we loved Casa Sorpresa. We are sitting outside enjoying your beautiful Casa Sorpresa - wondering if you chose all the furnishings and colours yourselves, so warm. The casa kitchen is so well equipped and having laundry access is great. Not especially busy at the beach right now. Rene, Sandra & Rosela are all super. Every day a day in paradise! We so thoroughly enjoyed our stay at Casa Sorpresa in Sayulita! From the time of booking until after we checked out, we felt very well taken care of. We absolutely loved the pool and surrounding seating area and this is where we spent most of our time when at the home. The town has so many interesting shops and restaurants and everything is within easy walking distance. Such a charming authentic town. Loved though that once we entered the gate into the home we we totally in our private sanctuary. Thank you so much Elsbeth and Rene for taking care of us! Rene was kind enough to make sure I got my sunglasses back after I accidentally left them behind. Highly recommend this property when staying in Sayulita. Casa Sorpresa was wonderful!!! Ideal location, close to downtown and the beach. We loved the privacy and security of the home. The secluded pool and courtyard were are favorite areas to relax, we could have easily remained on the property our entire stay! Elsbeth and Rene were a pleasure to work with, excellent communication and accommodating to our needs. My husband and I just spent 11 days at Casa Sorpresa and had the most amazing stay. The house is located about a 3 minute walk to a beautiful beach that had the best sunsets in Sayulita. It was (thankfully) a lot more quiet than the main beach but still had plenty of great bars to have a drink with your feet in the sand. It's also only a short walk to get to the city center - a perfect distance away from the best restaurants and shopping - yet far enough so you still have peace and quiet while at home. The house itself was perfect. The house keepers kept it super clean, the bedrooms stayed nice and cool so we had great sleeps, it was extremely well stocked with everything you could possibly need and THE POOL!!! The pool was absolutely amazing!! Rene the property manager was great as well - quick to respond and had awesome suggestions of things around town. Five stars all around. We will definitely be back. We stayed at Casa Sorpresa for 7 days in September and all I can say is that it was absolutely perfect! Sayulita is such a magical little town, but this home made our stay a hundred times better. It is only about 4 blocks from the beach and a 5 minute walk to town. There are several coffee shops and outdoor markets in the neighborhood. The layout of the home is wonderful with a central kitchen, outdoor living space, and 2 very large bedrooms with attached bathrooms. However, the highlight of the home is the AMAZING pool. We brought our own pool floats and spent about 6 hours a day pool-side. The courtyard is like a tropical paradise and we enjoyed it to it’s fullest! I will absolutely be returning to Casa Sorpresa one day. The customer service provided by the owner, property manager Rene, house keepers, landscapers, and drivers was absolutely incredible and we felt safe and well taken care of the entire time. You will not regret staying here. We had such an incredible stay at Casa Sopresa during our recent vacation in Sayulita! The house is very conveniently located close to the main plaza and beach, yet tucked far enough away to avoid loud noise and large crowds. The house itself is truly a palace fit for royalty. From the extremely comfortable beds, to the spacious kitchen with every amenity you could need, not a single detail was overlooked. And of course a special mention must go out to the beautiful garden area with the pool, where we spent many a beautiful afternoon. We would not hesitate to recommend Casa Sopresa to other people visiting Sayulita. Simply put, it was the greatest vacation of our lives and this house had a lot to do with that. We will definitely be back!! This was our family's first vacation to Sayulita and one of the reasons that it was so perfect was because of Casa Sorpresa. This gem of a house felt welcoming and comfortable from the moment we walked through the entry gate. The beautiful, bright colors and the lush landscaping made the courtyard feel like our own mini-resort for the week. Everything thing that we needed was available to us at the house and the close proximity to the beach and town could not have been any more convenient. Casa Sorpresa is a place that we will never forget and our first choice the next time that we visit Sayulita. Thank you so much tor the wonderful review you wrote for Casa Sorpresa and everybody being part of it and made it all happen! It is so Special to have this posted on our Website! So happy your family had such a special vacation! 50% due at time of booking, the remainder is due 90 days prior to check in. Rates are per night and in US Dollars. Please note there is a 5 night minumum stay during low and high seasons, and a one week minumum stay during holidays. Maximum 4 guests (4 adults plus two children is okay, but please check with us first). LOW SEASON $145 / night. Minimum 5 nights June - Oct 31. HIGH SEASON $220 / night. Minimum 5 nights. Jan 7 - June 1 and Nov 1 - Dec 18. Rates include maid, gardner and caretaker service. Please inquire regarding small pets before booking.